The Amtrak train engineer charged in the deadly crash in Philadelphia two years ago turned himself into police on Tuesday morning. 34-year-old Brandon Bostian was handcuffed on the street corner by police outside of the 9th district headquarters in front of a throng of reporters. He was led inside by his lawyers and dodged a bevy of questions by the press. 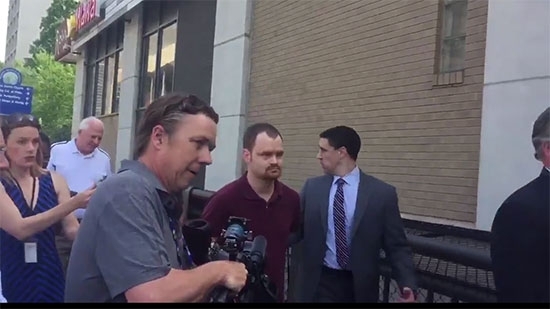 Bostian was charged by the Pennsylvania Attorney General last Friday, May 12th, two years to the day of the 2015 derailment in the Port Richmond section that left 8 dead and over 200 injured. Charges were filed hours before the statute of limitations expired. The NTSB determined the train was going 106 mph in a 50 mph zone around a curve in Frankford Juction. They found that he was not under the influence or otherwise distracted, and simply lost situational awareness and sped up where he shouldn't have. The Philadelphia District Attorney's office declined to press charges claiming it could not prove he acted with "conscious disregard." A private criminal complaint by one of the victim's families was approved by Philadelphia Municipal Court Judge Marcia Neifield. Those charges were expanded by the PA Attorney General to 8 counts of involuntary manslaughter and one count of causing a catastrophe. The convicted felon who shot a Delaware County police officer responding to a reported drug deal has pled guilty to multiple charges. 34-year-old Donte Brooks Island pleaded guilty to two counts of attempted murder, two counts of assault on a law-enforcement officer and gun offenses. Folcroft Police Officer Christopher Dorman was responding to a 911 call of suspected drug activity in June 2016. Dorman was shot seven times. He was hit in the face, leg and groin and required multiple surgeries. Dorman has since recovered and is back on duty. Island had previously served a lengthy prison term on a gun conviction. He faces 140 years in prison on these charges. Pennsylvania State Troopers arrested a father of three young children after discovering them left home alone in a hot house in Schuylkill County on Wednesday. Troopers received a tip about the children and went to the home in North Manheim Township. When no one answered the door they forced their way inside. They discovered a 22-month-old boy locked in a makeshift wooden cage (made of plywood and wooden lattice), a 1-year-old girl in a playpen, and a day old newborn girl in a baby seat. 38-year-old Cecil Kutz was arrested on child endangerment charges. The mother had given birth at home on Tuesday evening and was taken to the hospital because of bleeding on Wednesday morning. Kutz said he used the cage as a crib at night because his son would crawl all over the place. The mother expressed alarm when she heard the kids were left alone. The newborn was taken to the hospital and the two others were placed in the care on child welfare authorities. This afternoon, Sunny, chance of a shower or thunderstorm, temperatures around 90 degrees in Center City.